Online pre-registration was disabled at 10:00 pm Thursday, January 24, 2019. You can still register for the gathering in person at the Concert (Friday Night) or the School (Saturday and Sunday). Find where to go on the directions page. Music to inspire dreams for a better world. Traditions that strengthen social justice struggles. A community where singers, listeners, songwriters, fans, are welcome in a common space. The PMN Friday Night Concert takes place at the Community Church of New York U.U. (40 East 35th Street and near Park Avenue) starting at 7:30pm on January 25, 2019. It will feature PMN Artist in Residence Francisco Herrera and many other artists and groups. Tickets to this concert are included when you register for the entire gathering. Otherwise tickets can be purchased individually at this link. 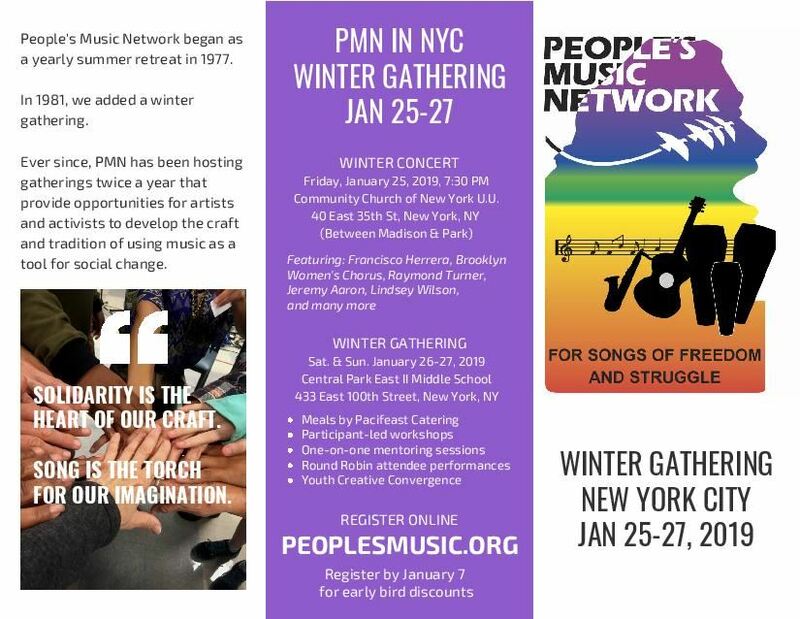 On Saturday and Sunday (January 26 & 27, 2019) at Central Park East II in East Harlem (enter from First Avenue and East 101st Street), we’ll have participatory workshops and song swaps, mentoring sessions, and a Saturday night Round Robin – all highlighting the role of music in progressive social change. A specific track of workshops for youth called the Youth Creative Convergence will take place parallel to the adult workshop. Expect numerous opportunities to share music, sing together, and to join efforts to bring music for progressive social change into the heart of struggles for justice and freedom today. See the side menu for details about all aspects of the gathering.